The final episode of the series saw everything from re-usable nappies to gamified toothbrushes to historical gin. But who sealed a deal with a Dragon? 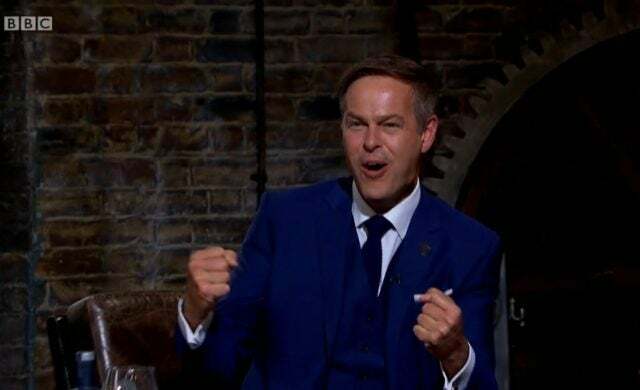 Though Valentine’s cards and heart-shaped chocolates abounded in the week before the Dragons’ Den Series 15 finale aired, the Dragons weren’t going to show any more love than usual towards the start-up hopefuls featured in the episode. In fact, warm fuzzy feelings were few and far between as entrepreneurs underwent harsh lines of questioning and had their finances scrutinised by five of the world’s most discerning investors. The characteristically tense finale saw an invention for soothing back pain, a brand of re-usable nappies, a Scottish gin business and a Startups Awards-nominated kids’ gadget pitch for investment. But just two of these left the Den having said yes to an investment proposal and started a relationship with a Dragon. Eco-entrepreneur Sophia Ferguson confidently told the Dragons that she was presenting “an opportunity to invest in a start-up that has doubled its sales in first 18 months of trading”. With the start-up in question, re-usable cloth nappy company Tickle Tots, Ferguson was looking to disrupt the £43bn global nappy market with waterproof, wipeable nappies whose adjustable sizes enable them to last from birth until potty training. After Tej Lalvani complimented the quality and design of the nappies, Jenny Campbell seemed impressed that Tickle Tots was retailing in Italy and Germany as well as its home country, with 40% of sales coming from outside the UK. Despite a promising start, however, the pitch stalled when Ferguson revealed her less-than-ideal profit margin of roughly £4 per nappy. But she held her own by explaining that, with growth, she will get better pricings from suppliers and so her margins will improve – and that she is in a position to boost them further by sea-freighting instead of airfreighting. Lalvani then asked about stockists and, despite having recently approached John Lewis, Ferguson admitted that she didn’t feel confident enough to approach “the big boys” yet because she still “needs to iron out the manufacturing” – which concerned Suleyman in particular. The textiles expert highlighted Ferguson’s expenditure on fabric – a hefty £5 per metre – as too high, and raised doubts about the business’ growth potential as well as what he called its “tiny” £23,000 turnover. Environmentalist Deborah Meaden, on the other hand, was impressed by the re-usable nappies’ sustainable raw materials and production. But Peter Jones faced a conflict of interest, with his partner, Tara Capp, set to launch her own nappy range. The Dragon also didn’t mince words when it came to Ferguson’s position in the market, telling her she wouldn’t be able to compete with nappy behemoth Procter & Gamble – and opting out of the investment opportunity. Campbell, Meaden and Lalvani followed, leaving a torn Suleyman to consider an investment. After learning that the entrepreneur had put in £25,000 of her own money and also worked as a carer to keep herself afloat, Suleyman conceded that she would need a lot of support to grow the business. Placing an unusual offer on the table, Suleyman said he would need 50% equity to contribute as much as he could. After he agreed to give back 10% upon getting his money back, Ferguson accepted the offer. Year one: Sales of around £8,000 from the UK, with a net loss of about £100. Year two: At the time of filming in 2017, the start-up had taken more than £23,000 and was predicting a net profit of £3,000. Peter Jones: “What you’ve created is really great, and I can see you selling a few into the smaller outlets, which are pretty niche. But in terms of making this a mainstream product, I think you haven’t got a chance. Deborah Meaden: “This has been battering against the marketplace since it started. The marketplace has been over here with disposables, and there’s always been that growing market of the environmental issue; it’s becoming even more pertinent now. With a truly ambitious food, drink and events empire in his sights, Aberdeenshire entrepreneur Stuart Ingram entered the Den to present just one segment of his multi-faceted brand, House of Elrick – its gin-producing arm, which he had launched six months prior to filming. With the famous Loch Ness as its water compound, the gin was inspired by Ingram’s stately family home, Elrick House, which Ingram planned to convert into a gin distillery, restaurant and wedding venue. The Dragons were impressed by the business’ sales record of 2,800 bottles within six months, and were happy with its margins – with each bottle costing £16.44 to make and retailing at £38.50. His rosy financial forecasts, too, seemed overly-ambitious to the Dragon, who questioned how he would achieve them in such a crowded market. Ingram responded that the value would be in the entire House of Elrick brand, with all its products, its restaurant and its destination venue, as well as its gin. Suleyman took issue with this – “You’re going to be pulled from all directions!” – but Jones saw magic in the house and its backstory. Throwing something of a curveball, he asked whether Ingram would be willing to let him invest in the entire brand, not just its gin. Ingram admitted that he’d had “no idea” how he might finance the entire brand, and had simply been developing the facets of it that he could afford to during weekends, evenings and lunch breaks while working his day job as a contracts engineer. The Dragons admire such dedication, and Campbell was no exception. A self-confessed gin-lover, she wanted to know more about the House of Elrick restaurant, which Ingram said would be “field-to-fork”, targeting Michelin stars. But Campbell cautioned that the restaurant business is a tough nut to crack. Tej Lalvani: “Stuart, I like the taste. I’ve not invested in any drinks companies as yet, so I was quite excited when you came with this product. When I saw the packaging, the presentation, and what you’ve achieved in six months – it’s quite remarkable. Peter Jones: “The more I drink, the more interested I get. But you pitched the House of Elrick, and you pitched the Bonnie Prince Charlie, and it’s all a good story. But then when you say, ‘I’ve got a property which is £650,000’ – to me it goes together as one. You were potentially willing to discuss that, because you see the whole vision and the big package. “So, on that basis, I’m going to make it difficult and make you an offer. I’m going to offer you all of the money, £80,000, for 10%, but the 10% includes the property, includes the business.